Ponder this: Two resumes are received, one with 58% of the job requirements and another that meets 100%, but the 58% resume gets the interview. Yes, it’s completely illogical. Job-search science data from TalentWorks reveals that you are just “as likely to get an interview matching 50% of requirements as matching 90%.” If you’re not familiar with the term “Job-Search Science,” I define it as the application of data in order to identify the factors that have the most impact on a successful job-search success. And despite what your high school career counselor told you, this means you increase your odds of getting an interview when you apply for every job where you meet 50% of the requirements and – as other data show — when you come within two years of the required experience. The primary reason that TalentWorks research is so powerful is that the resumes submitted for open corporate jobs come from thousands of disconnected individuals. Their site actually applies for jobs on behalf of their clients. In this rare case, this firm can use its algorithms to precisely identify what it takes to earn an interview over thousands of applications. In this version of their research, they analyzed job postings and resumes analyzed job postings and resumes for 6,348 applications across 118 industries from their database of users. And their data revealed some conclusions regarding getting an interview that I think you will agree can only be classified as startling! After meeting 60% of the qualifications, with added qualifications your interview odds decrease — Matching “60% or more of job requirements didn’t provide any additional boost in the interview rate.” And, sadly, after an applicant meets 60% of the requirements, any additional qualifications would actually reduce their chances of getting an interview. The fact that increasing an applicant’s qualifications also increases their rejection rate should be alarming to all corporate recruiting leaders. In the following chart you can see that right after meeting 50% of the qualifications, the “blue interview success line” flattens and then decreases. For men, meeting 50% of the qualifications is as good as 90% — with little noticeable improvement in their chances after 50%. For men, the sweet spot is applying when you meet between 50% and 60% of the qualifications. For women, the minimum qualifications target is lower because 40% is as good as 90% — For women “matching 40% of job requirements is as good as matching 90%” of them. For some unexplained reason, women need fewer qualifications in order to be granted an interview. 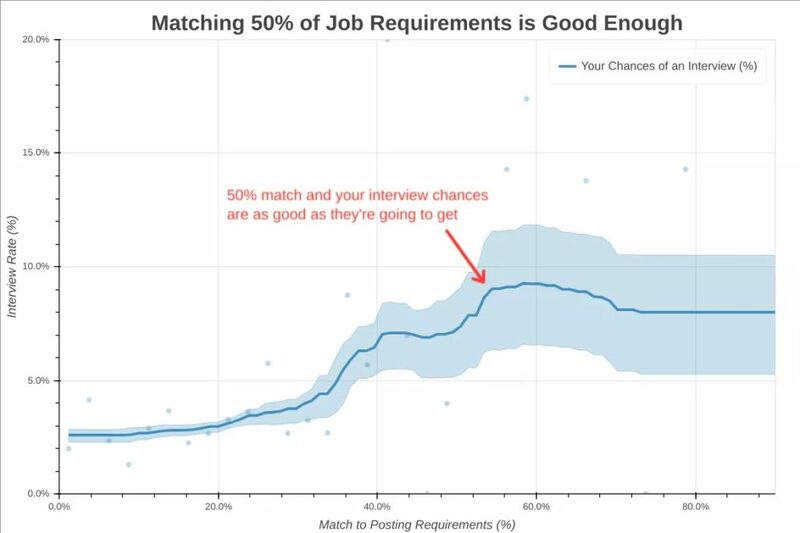 Even highly qualified people have a minuscule chance of getting an interview — A resume that meets 90% of the qualifications has only a minuscule “15% chance of getting an interview.” These ridiculously low odds for an almost completely qualified applicant seem crazy. Even though we know that as few as 2% of jobseekers will earn an interview (source: TalentWorks and Glassdoor.com), most have simply assumed that these rejected candidates were unqualified. But now we have data showing many of the rejected were highly qualified and some that were offered interviews had only 40% of the requirements. The fact that corporations don’t reveal these miserable odds to potential applicants is nothing short of an FTC qualifying fraud. Now, moving beyond the percentage of qualifications needed in order to get an interview, Talent Works’ comprehensive job-search science research went further and identified 13 data backed factors covering resume content and when to apply. I completely agree that following these guidelines will significantly multiply your chances of getting an interview. TalentWorks’ research quantifies just how much the following resume content actions will boost your chances of getting an interview. The highest impact of resume/application actions is listed first. Start your sentences with action verbs – a 140% boost — Distinct action words really make a difference including created, developed, acted, discovered, took charge, analyzed, etc. Include key skills – a 59% boost — Most people should add 15-20 skills to their resume. These skills might include technical skills like coding and sales as well as soft skills like communications, collaboration, teamwork and being self-motivated. Include leadership words – a 51% boost — Adding strong, active, leadership-oriented words will also help you. They recommend adding strong, active words like led, leadership, managed, organized, directed, oversaw, etc. Demonstrate results with numbers – a 40% boost — Using concrete numbers increases your hireability results. I would also add the importance of quantifying your accomplishments in dollars. Add industry buzzwords – a 29% boost — Keywords are critical for human, LinkedIn and ATS searches. So be sure you include all of the important functional, corporate values and industry words and phrases found in the relevant job description. It is unlikely to be the ATS system, so there must be something that is time sensitive in recruiter behavior that gives the timing of your application for a job such a large impact. The time of day when you apply matters – an 89% boost — It shouldn’t matter, but applying in the morning between 6 am, and 10 am boosts your chances dramatically. My educated guess is that this advantage occurs because recruiters are more likely to instantly see and act on an application in the early morning before they get really busy. It shouldn’t, but applying immediately after the job is posted also matters – a 65% boost — From the corporate perspective, it shouldn’t make any difference when you apply, but it does. For example, if you apply during the first four days after the job is posted, your interview chances are clearly boosted significantly. It shouldn’t, but the day of the week that you apply matters – a 46 % boost — TalentWorks research found that applying on Monday boosted your chances dramatically. And applying on a Friday or Saturday ended up hurting your chances. Perhaps seeing your resume at the very beginning of a soon to be hectic week helps to get it shepherded along. Don’t use personal pronouns – a 55% negative hit — People who used even one personal pronoun in their employment section had a significantly lower chance of getting an interview callback (it is OK to use them in the objective or professional summary section). Some examples of the pronouns to avoid are: I, me, mine, myself, we, us and ours. Don’t (only) be a “Team Player” – a 51% negative hit — This advice is a little counter-intuitive. Yes, it’s good to say that you are a team player, but it’s also important to reveal that you have also owned, managed or directed. Be aware that many collaborative words also have passive, subordinate, weasel-word undertones, which could imply you passively follow the team too often. Don’t include a career objective – a 29.6% negative hit — Job applicants whose resume contained an objective were less hireable than those who didn’t specify an explicit objective. Providing a career objective may inadvertently reveal that you’re only starting your career and that you are not very experienced. Providing a professional summary is a superior approach. Obviously, it doesn’t make sense to rely upon only a single source of research. So, you should be aware that other research has also revealed that the screening process is broken. For example, a similar study that used “mystery shopper research” found that among submitted tailored resumes that met or exceed 100% of the job specs, “only 12% were actually scheduled for interviews” (Source: Hodes healthcare by Hart & Haeberle). Other research clearly demonstrated that resume screening is often highly biased. If it was unbiased, something as simple as changing a person’s first name wouldn’t make any difference in their interview offer rate. In these two separate research studies, identical resumes with only a change in the first name were sent out. In the first study changing the first name from Aisha to Kristen increased the interview offer rate by an amazing five times (University of Chicago/MIT study). And in a second study, changing the first name from Mohamed to Adam increased the response rate by three times (BBC Inside Out). WOW, from both an applicant and a corporate recruiting leader perspective, something is clearly wrong with the screening process. And without complete corporate transparency covering success rates, I fear that resume screening processes will never get significantly better. Overworked recruiters with unreasonable req loads. Job description requirements from hiring managers that are constantly in flux. Wrong words entered into the ATS search process. Resume screeners lacking the technical skill to assess technical. Not periodically revisiting a sample of the rejected applicants to identify the screen in / screen out error rate (Google implemented Project Janus to assess their error rate). For decades I have been a data-driven recruiter, so I welcome even this painfully slow shift to a data-driven approach to job search and resume screening. It’s been over a decade since the first job-search science research conducted by CareerXroads, where they used mystery shopper resumes mystery shopper resumes to assess the level of corporate responsiveness to applicants. And since then, outside of the revealing Google data in the book Work Rules, there has been little progress in scattering and publishing job-search science data. But finally, we now have a job-search science driven vendor doing business as TalentWorks. Of course, I have no economic connection with them. However, I still recommend that all jobseekers and corporate recruiting leaders first read their multipart “Science of Job Search “Science of Job Search” series of nine articles by Kushal Chakrabarti and Claire Jaja. And then I recommend that you subscribe to their cheatsheet blog. In my experience, I have found that an applicant following even a portion of their data-driven advice will more than double their chances of being granted an interview. And finally, one last suggestion, stop listening to career counselors that provide opinions rather than speaking exclusively with job-search statistics. He’s a prolific author with over 900 articles and 10 books covering all areas of talent management. He has written over a dozen white papers, conducted over 50 webinars, dozens of workshops, and he has been featured in over 35 videos. He is an engaging corporate speaker who has excited audiences at over 300 corporations/ organizations in 30 countries on all six continents. His ideas have appeared in every major business source including the Wall Street Journal, Fortune, BusinessWeek, Fast Company, CFO, Inc., NY Times, SmartMoney, USA Today, HBR, and the Financial Times. In addition, he writes for the WSJ Experts column. He has been interviewed on CNN and the CBS and ABC nightly news, NPR, as well many local TV and radio outlets. Fast Company called him the “Michael Jordan of Hiring,” Staffing.org called him “the father of HR metrics,” and SHRM called him “One of the industry’s most respected strategists.” He was selected among HR’s “Top 10 Leading Thinkers” and he was ranked No. 8 among the top 25 online influencers in talent management. He served as the Chief Talent Officer of Agilent Technologies, the HP spinoff with 43,000 employees, and he was the CEO of the Business Development Center, a minority business consulting firm in Bakersfield, California. He is currently a Professor of Management at San Francisco State (1982 – present). His articles can be found all over the Internet and on his popular website www.drjohnsullivan.com and on www.ere.net. He lives in Pacifica, California.